GitHub - johnjohndoe/LineReader: Reading a text file line by line aka block wise. Reading a text file line by line aka block wise. 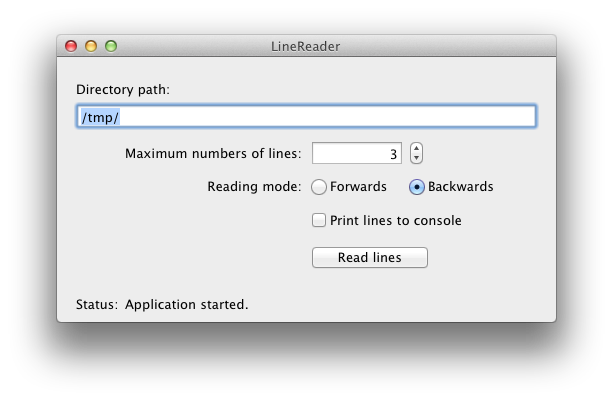 Want to be notified of new releases in johnjohndoe/LineReader? A collection of classes to implement a file reader that can read a specific amount of the content of a file. Instead of reading the whole file at once the aim is to read block wise. The file contents can be read forwards or backwards. The included FileReader class originally has been created by Dave DeLong. Here you can find his answer on a question at stackoverflow.com. The screenshot shows the current implementation. The following configuration is used for the project.